Updated 2/9/17: The Crown Hill/Whittier Heights FIFI walk outcomes report can be downloaded here. A handout that went to all City Officials and the Mayor about neighborhood needs is here. 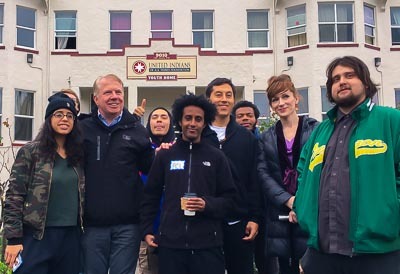 November 23, 2016: Seattle City Mayor Ed Murray and key City Department Directors joined over fifty Crown Hill and Whittier Heights neighbors on Saturday, November 19, 2016 for a city-sponsored Find it Fix it Walk. Residents had the opportunity to share their concerns about issues including growth in the Crown Hill Urban Village area, zoning and infrastructure issues, and crime in the neighborhood. The event began at Baker Park, where neighbors gathered to hear comments from Mayor Murray, introductions to the Directors in attendance and from a neighborhood advocate who focused on slow police response times and crime in the area. Then participants walked a 1.3 mile loop through the neighborhood, while residents shared their thoughts with city employees. 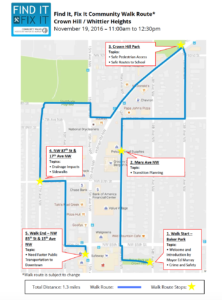 There were five stops on the walk, Baker Park, 87th and Mary Street NW, 13th and Holman St. NW, 87th and 17th Street NW, and 15th and 85th NW, where neighborhood advocates spoke to the crowd about key areas in need of attention. You can download the summary of key issues and concerns discussed on the walk we provided to all city officials here. In a Crown Hill Urban Village Committee for Smart Growth survey taken by 575 residents over the summer, it was found that neighbors place top priority on improvement of police response time. Burglaries in the North precinct, are four times that of the West and East precincts. Included in concerns about crime was the high incidence of drug dealing, camping and late night partying in Baker Park. 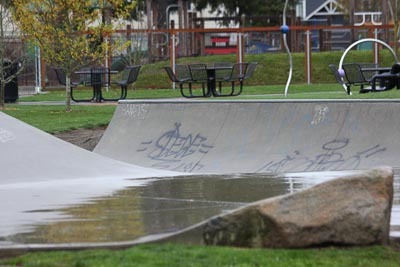 Suggested solutions for activating the park and discouraging crime there include starting a community pea patch and adding a dog park, ideas suggested by neighbors in comments on last summer’s community survey. KIRO TV covered the walk and crime concerns here. A neighborhood advocate noted how the area was an example of development without proper planning. In contrast to new town homes being built on one side of the street, an affordable housing building faced a street which many residents avoid due to poor maintenance and excessive garbage including discarded needles. Lack of community planning and design guidelines resulted in poor sightlines and placed housing fronting the back of commercial buildings, conditions that undermine a livable community. Suggestions for improving the area included cleaning up the area in general and centering planned upzones in CHUV here, where there is opportunity for growth and a need for improvement. The speaker stressed that guiding growth with planning and design guidelines would both create on-site affordable housing and build a thriving neighborhood center that would benefit all residents. Neighbor advocates shared concerns about pedestrian safety on this busy street. Requests included the installation of traffic calming measures and sidewalks, addressing the needs of cyclists and those with disabilities, special focus on streets near schools and parks, and continuation of work begun, but not completed, on Holman Road via the Bridging The Gap levy. Neighborhood advocates highlighted extensive drainage and flooding issues, which are of particular concern in areas like these without sidewalks. During heavy rains, water floods streets and yards and makes pedestrian and vehicle travel along the streets difficult and dangerous. Neighbors also report feeling unsafe walking this area with children and after dark as it sees heavy traffic due to vehicles cutting through the neighborhood to avoid traffic on 85th NW. At the final stop, speakers noted the need for better capacity on the D Line to downtown, which is currently over capacity during rush hour, with full buses often bypassing stops. With seventeen new developments under permit and already slated for the area, residents will need greater access to bus transportation and other transit options. CHUV is currently one of four Urban Villages being upzoned without plans for light rail. Neighbors have placed a high priority on transportation and ask that it either be expanded to accommodate growth or that growth and re-zone plans are adjusted to realistically meet city livability goals as outlined by HALA. A handout that went to all City Officials and the Mayor about neighborhood needs is here. The City is expected to share its response to the comments and concerns shared by walk participants by late January or early February. These results can be found at on the Find it Fix it website and will be emailed to all who attended the event. Walk participants were also encouraged to apply for funds via the Find It, Fix It Community Project Grant program for community-led volunteer projects. The deadline to submit applications is Monday, November 28. Special thanks to neighbor volunteer Kendahl for drafting this post.